By and large, the free labor market in most advanced economies has performed these functions well in the seventy years or so. Skills have been matched to capital, producing (over the long run) dramatic increases in economic output. Paid jobs have provided a social anchor for men (and now women), packaging purposeful work into manageable pieces. And until recently, wages have proved a successful mechanism for sharing the proceeds of growth. This long record of success shapes almost every social and economic policy debate. To tackle poverty, we must get people into jobs. To lift economic productivity, we must boost skills. To reduce income inequality, we need to narrow the wage gap. And so on. In every case, and whether from the political left or right, the goal is to improve the labor market. This is why the idea of a universal basic income (UBI) is capturing the imagination and attention of policy intellectuals, across the globe and across the political spectrum. If the labor market is no longer going to cut it in terms of distribution, it might be time for more radical solutions. The Swiss are holding a referendum on the idea in June. In the UK, the Royal Society of Arts, Manufactures and Commerce is leading a major new project on a British UBI. The idea is now gaining traction among U.S. libertarians from the Cato Institute, led by Matt Zwolinski, social conservatives like Charles Murray from the American Enterprise Institute, and left-wingers like Matt Bruenig and Elizabeth Stoker. This June, the former President of the SEIU union, Andy Stern, is publishing a book, Raising the Floor, arguing for a UBI. After five years of study and conversations, Stern has decided that “this time is different”. The problems in the labor market are not fleeting symptoms but tectonic shifts. Stern will argue that the answer for American families is “an old idea whose time has come—a universal basic income. It is an old idea, too. Friederich Hayek endorsed it. Milton Friedman advocated a version in the form of a “negative income tax.” Nixon’s modest 1970 version, a $1,600-a-month Family Assistance Plan, died because of political disagreements over work requirements. In the UK, the Labour Party’s Social Justice Commission (which I served) considered it in 1994. It was rejected then for the usual combination of economic and political reasons: the cost would mean high tax rates on ordinary wages, creating strong disincentives to work; and there was no chance the electorate would buy it anyway. Similar effects will be seen in other nations that rely heavily on means-tested benefits and tax credits to boost low incomes. 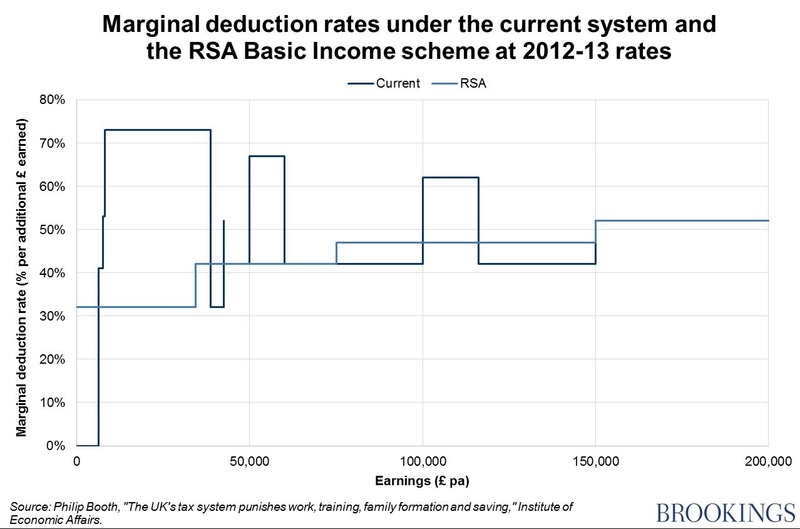 So, the economics of a basic income likely make more sense today. What about the politics? Especially in America, where the Protestant work ethic came to live? Right now, a basic income would represent a huge leap away from the existing American social contract. But the political mood is shifting in unpredictable ways. What the supporters of both Sanders and Trump share is a sense that things are badly broken down. Radical ideas are all the rage. A basic income is moving in from the margins. I don’t think we can – or should – rule out the possibility that it will enter the mainstream.